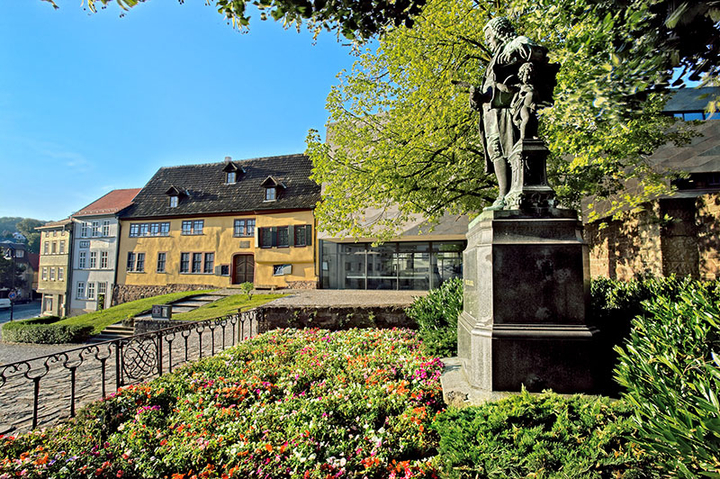 The world-wide first and largest museum dedicated to the composer Johann Sebastian Bach is located in his native town Eisenach. Since 1907 visitors have marvelled at the collection on Bach’s life and his music. 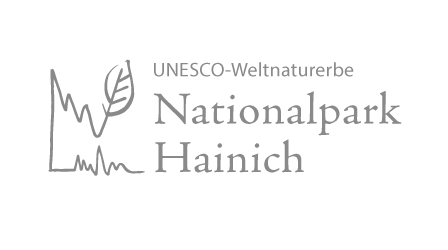 In Bach’s native town there is the largest Bach-museum in the world: Authentic living rooms in the historic part of the museum give an insight into the life of the family of town musicians Bach at around 1700. The adjacent award-winning new building is dedicated to Bach’s music in a multimedia designed, exciting exhibition. Hovering “Bubble-Chairs“ and the “walk-in piece of music“ invite to an extraordinary musical enjoyment. Special extra: In the instrument hall all visitors can enjoy a little live concert, played on baroque keyboard instruments. In the baroque garden and the “Café Kantate“ it is wonderful to stay for a while. 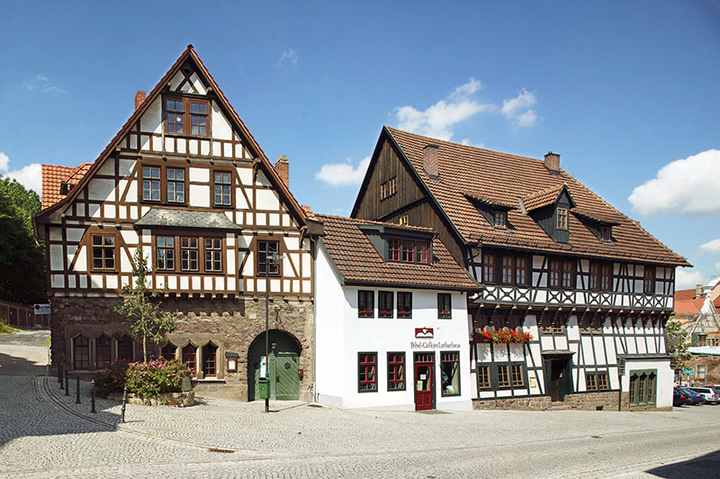 In the probably oldest half-timbered house of Thuringia Martin Luther is reported to have spent his most wonderful and formative school days with the Cotta family.The lovingly designed museum in the Lutherhaus presents him as a student, reformer and bible translator. Only a few steps away from the market place, the richly ornamented Lutherhaus opens its wooden gate to the curious visitors. During his school days from 1498 to 1501, young Martin Luther was met here with a warm reception by the reputable councilman’s family Cotta who gave him also intellectual stimulus. On an elevation over the roofs of Eisenach’s mansion district there is the Fraternity Memorial. The monumental 33-m structure is dedicated to those who advocated unity and freedom for Germany in the 19th century at the risk of losing their lives. The Fraternity Memorial, inaugurated in 1902, is accessible through a heavy iron door. 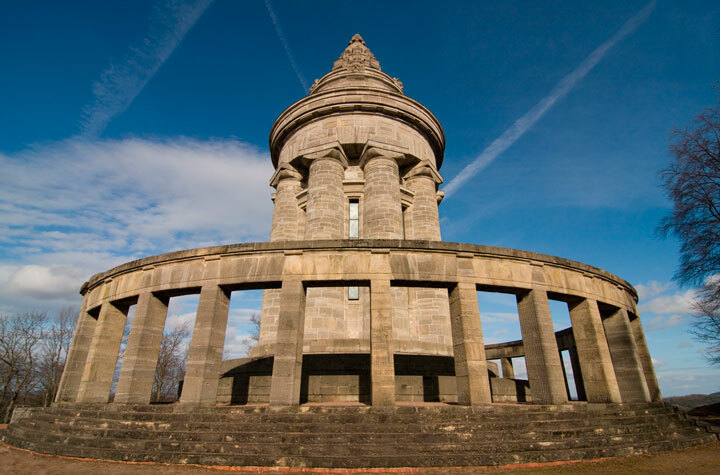 The monumental structure reminds of the Wartburgfest of the fraternities in 1817 and is at the same time a memorial for the fraternity members who fell in the German-French war. Modelled on ancient Greek tombs and combined with Germanic elements, the memorial surprises on the inside with an imposing ceiling fresco with golden ornaments, window glass art and a rich décor of effigy. 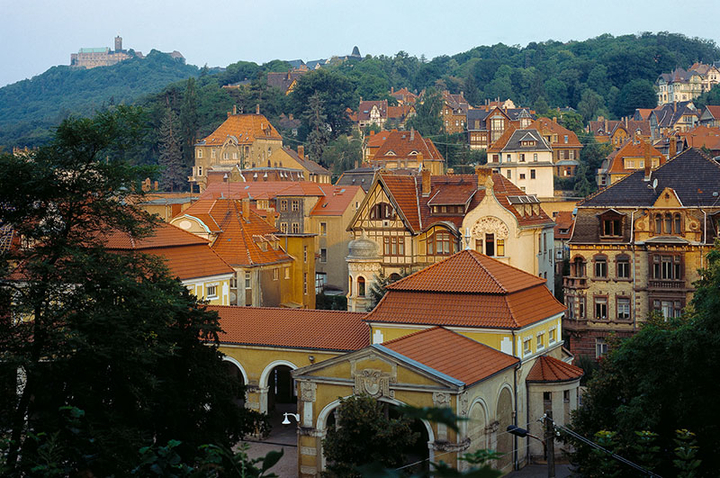 Six balconies offer a mesmerising panorama view over the Thuringian Forest, the Hörselberge, Eisenach and the Wartburg. The 1,000-year-old Wartburg belongs to the UNESCO world heritage – this is where history manifests itself like in no other place of the republic. Lushly decorated buildings and chambers testify impressively to medieval and romantic architectural and life culture. The Wartburg is probably the most famous German castle. In the 12th century it was the venue of the legendary singing contest with Walther von der Vogelweide, and little later it was the residence of Elizabeth of Hungary. In 1521 Martin Luther found protection and inspiration here for the translation of the New Testament. In 1817 the German fraternities met within these walls to have their Wartburg celebration, and later it inspired Wagner to write his romantic opera ”Tannhaeuser“. Revived in the 19th century, the Wartburg invites nowadays to a visit to the medieval palace and the museum and is likewise a venue of unique atmosphere and a magnificent view. The dominant design and its monumental size of the cathedral and the and St. Severus is one of the greatest Medieval constuctions on German soil. 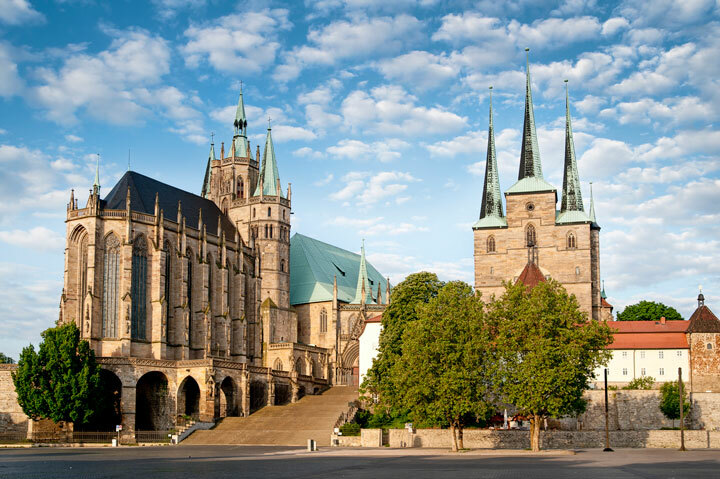 The Catholic Erfurt Cathedral is a 1200 year old church located on Cathedral Hill of Erfurt. It is of an International Gothic style, and is also known as St Mary’s Cathedral, and is located quite uniquely, on a hillside. Centuries formed the current shape of the cathedral. From the shape of its foundation there is no documentation nor of the 1153 collapse of the St. Mary’s Cathedral. Since the end of 19. 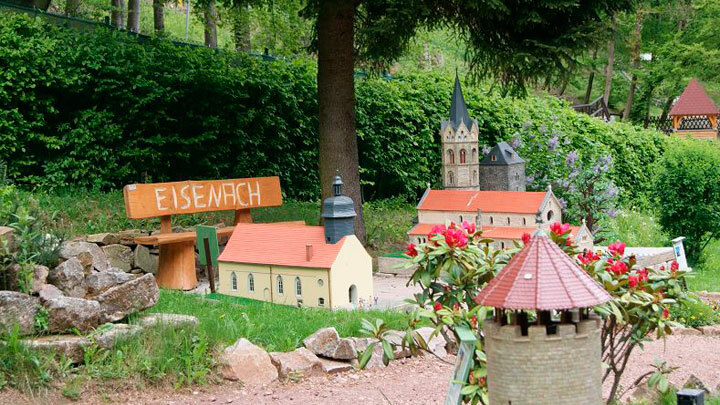 Century the city of Eisenach has endeavored itself to promote the health tourism enterprise. In order to furnish a growing enterprise, they developed at the edge of the Karthausgarten – a park after an English model -with all necessary health resort facilities with a central point being the open hall with its music pavilion. 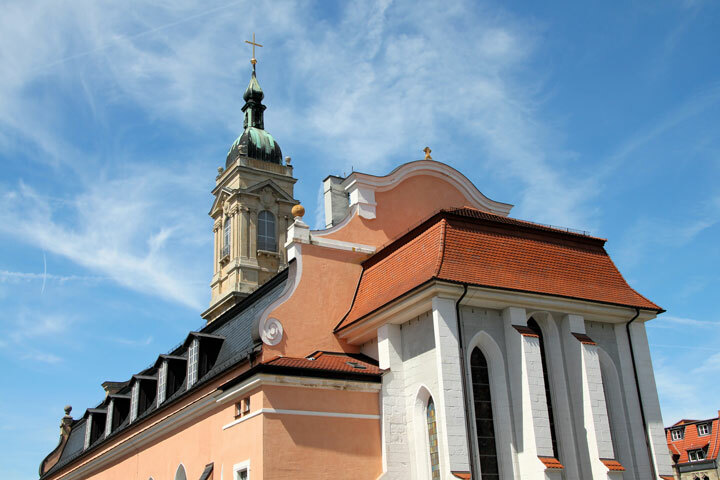 Elizabeth of Hungary, Martin Luther, Johann Sebastian Bach are as closely related to the Protestant principal church St. Georgen as Georg Philipp Telemann and Johann Pachelbel. In the Georgenkirche, founded by Ludwig III at the end of the 12th century, 14 year-old Hungarian daughter of the king, Elizabeth, married Ludwig IV. This is where Martin Luther sang in the choir as a student, later on he preached in this church, right before he was taken to the Wartburg for his protection. For more than 132 years members of Johann Sebastian Bach’s family made music on the organ bench of his baptistery. The Wartburgfest (Wartburg festival) of the fraternity in 1817 started off here, just like the prayers for peace in 1989. The unusual possibility to experience many hundred meters under the day surface. Feel what it means, to be a miner. Approximately 1,900 workers produce the OPEL Corsa in Thuringia. The OPEL Eisenach GmbH works since 1992 with most modern production plants and methods. Augustinian’s hermit’s monks established the vast complex of buildings since 1277. In spite of fires and war destructions essential parts of the arrangement have been preserved. In Eisenach cars have been built for over 100 years. 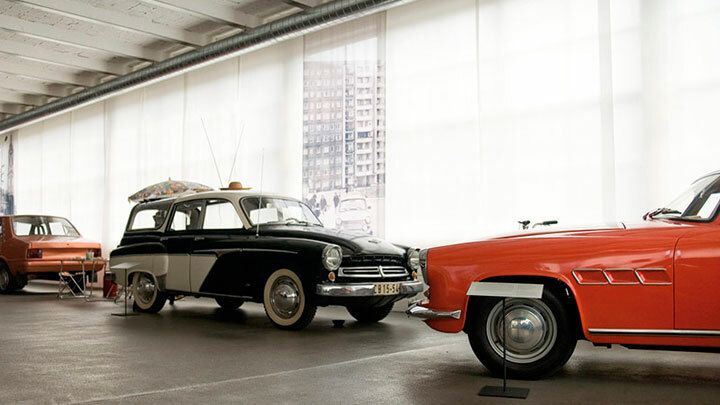 Where once the famous Wartburg rolled off the line, there is nowadays an exhibition, maintained with loving commitment, presenting the moving history of the automobile manufacture in Eisenach – from DIXI to Opel. 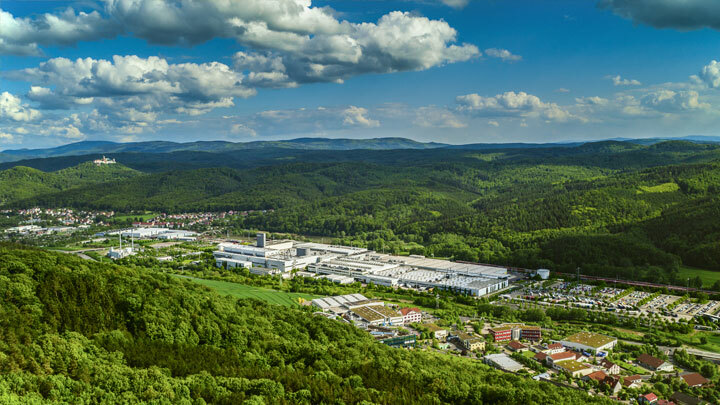 In 1899 the first “Wartburg motor vehicles“ left the production plants in Eisenach and established the automotive tradition that is still vibrant today. In 1928 the BMW had its hour of birth, and from 1953 on the Wartburg was produced. The last car produced in the plant rolled off the line in 1991 and went right into the museum. In a historic shop floor automobile welt eisenach shows an impressive exhibition: Historic vehicles, car body studies, prototypes and construction plans are among the fine pieces of the museum. A special highlight is an AWE racing car that celebrated a sensational victory in the German Championship in 1956. The baroque city palace once served as ducal residence. After years of restoration it is presently awaking from a deep slumber and is shining in new splendour. 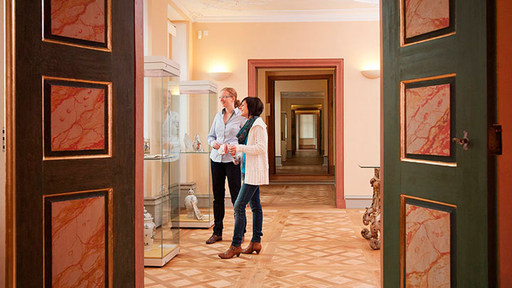 In the magnificent rooms you can enjoy folkloristic entertainment, oddities and precious things. Those who take a look at the impressive front of the Eisenach city palace on the northern side of the market place would not believe that the builder skilfully included six venerable town houses. In 1755 the Duke of Sachsen-Weimar-Eisenach moved into the imposing residence and numerous famous visitors – like Goethe and Mrs von Stein, Telemann and Richard Wagner – paid a visit. Nowadays, the city palace houses the tourist information and the Thuringian Museum. China, glass, graphics, ironwork, garbs, paintings, a historical pharmacy and much more can be discovered in the imposing exhibition rooms. 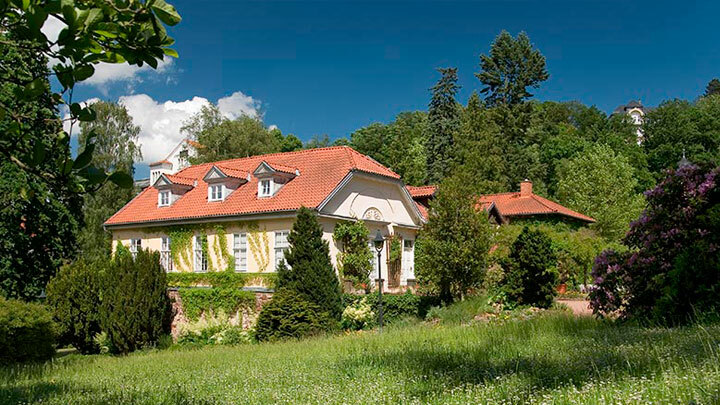 The mansion at the foot of the Wartburg, built in 1866, makes bourgeois cultivation of home decor of the 19th century come alive thanks to the widely preserved equipment of Fritz Reuter’s living rooms. Since 1897 it has also housed the largest Wagner collection outside Bayreuth. The 19th century was the heyday of romantic artists, thinkers and musicians. In the stylishly furnished salons of the Reuter mansion the spirit of this era is still palpable. Here, the Lower German poet Fritz Reuter and his wife Luise spent their declining years. 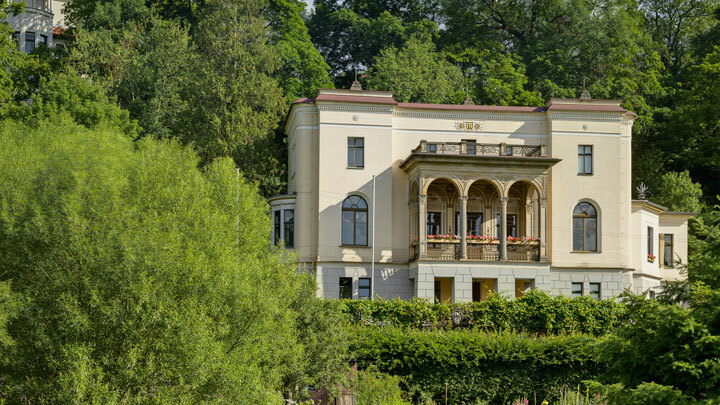 In this mansion the Richard-Wagner collection of Nicolaus Oesterlein has been exhibited since 1897. The passionate Wagnerian collected everything related to the ”master“ and his works. From letters to posters, newspaper articles and photos to original scores the collection comprises over 200,000 objects. The library with more than 5,000 books occupies centre stage. 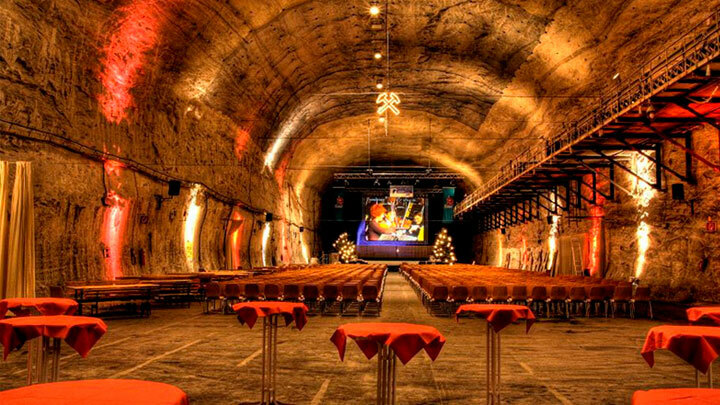 There is a unique atmosphere within the walls of the 700-year-old Dominican church of Eisenach. In the former monastery church an exhibition of sacral carved sculptures testifies faith and piety of the people in the Middle Ages. In the 13th century the Dominican church was built as part of a Dominican monastery in honour of Elizabeth of Hungary. 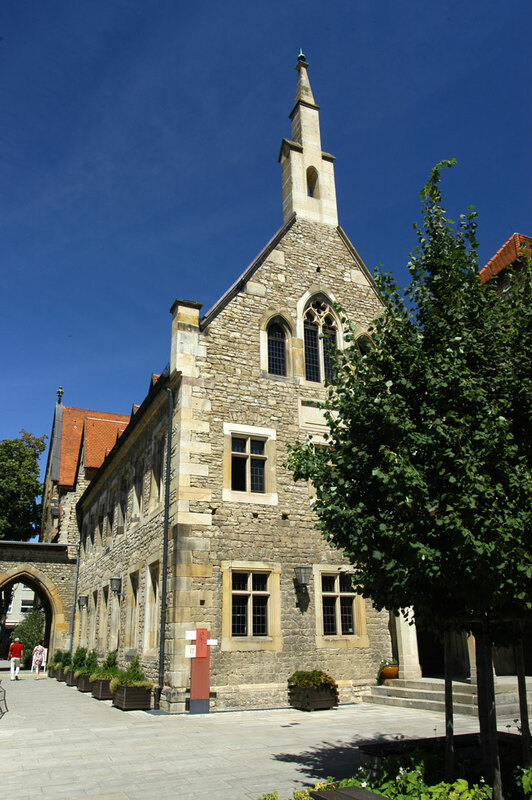 In the 16th century the living and work rooms of the monks were converted into the Latin School and later into the Martin-Luther-Gymnasium (secondary school). 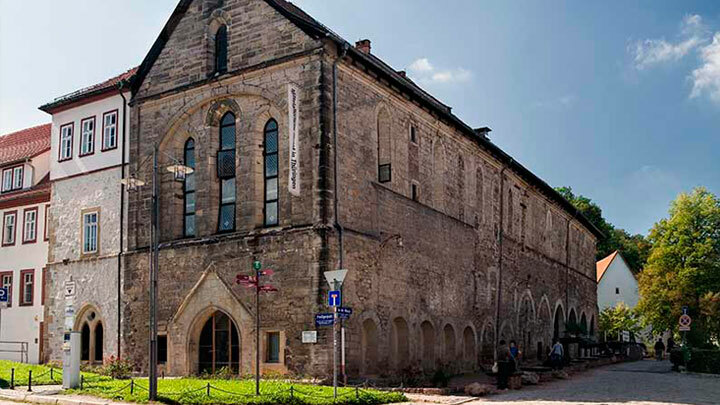 For more than 100 years this church has belonged to the Thuringian museum Eisenach. In its solemn rooms – particularly in the old crypt – there is an exhibition of modern design of the largest stock of old medieval carved sculptures in Thuringia. Multicoloured figures of saints, altars, tombstones, liturgical tools and sculptures give an insight into the world of faith and life of the people in the Middle Ages. The gardener’s house amidst the idyllic Carthusian garden was built in the middle of the 19th century and houses a small salon at ground level that is decorated with precious French wallpaper pictures. They tell the love story of Cupid & Psyche. The Carthusian garden is an “enchanting facility in the most elegant, natural style“ and at the same time ”a wild garden”, as contemporaries describe the park in the mansion district of the town that was already planted as a monastery garden in the 14th century. Serpentine paths, gorgeous views and many botanic rarities make a visit to the park, nowadays listed, worthwhile. There is a little surprise for the visitor in the gardener’s house: In a little salon at ground level there are precious French wallpaper pictures on the walls with the subject of the fairy tale Cupid & Psyche. How this valuable wall decoration found its way into the gardener’s house, built in 1825, remains a mystery. The plain front hardly paints a picture of the events of far-reaching implications that took place behind it. In 1869 the Social Democratic Labour Party was founded here. Today the building accommodates a memorial and the office of the August-Bebel-Society. 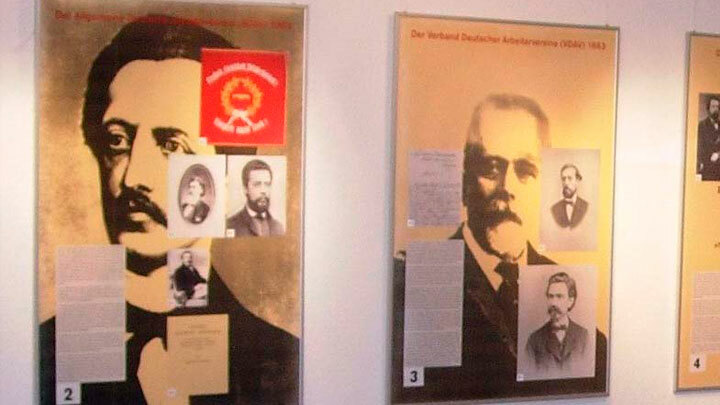 In Eisenach there is one of the most important places in the history of the German social democracy: On 7 August 1869 the pub „Zum Goldenen Löwen“ was the scene of the founding congress of the Social Democratic Labour Party (SDAP) under the leadership of August Bebel and Wilhelm Liebknecht. Until today it is considered the cradle of the German social democracy. The August-Bebel-Society’s objective is to protect the tradition of the memorial, to open it to the general public and to make a contribution to political education in the form of events, seminars and lectures.